Dr. Ramirez was born and raised in Karnes City, Texas. After graduating from Karnes City High School, he attended The University of Texas at Austin where he received his Bachelor of Arts Degree in Biology. Dr. Ramirez then attended the University of Houston College of Optometry in Houston, Texas, where he earned his Doctorate of Optometry Degree. 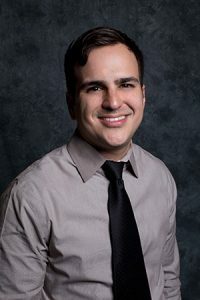 During his clinical rotations, Dr. Ramirez received training to manage many ocular diseases such as glaucoma, macular degeneration, dry eye, and retinopathies associated with diabetes and hypertension. Dr. Ramirez worked with children and adults with special needs to help improve their visual function, a passion Dr. Ramirez takes great pride in. Dr. Ramirez was also the Vision Science teacher for the Texas Optometry Career Opportunities Program (TEXOCOP), a program geared to help students pursue not only optometry school, but to further their education into the medical field.